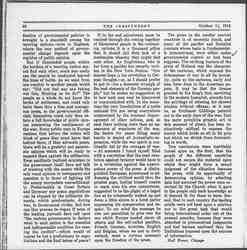 Any one who has been interested in a huge strike, or a similar social upheaval upon which public opinion naturally divides, must have been impressed with the ability of the press, whether "capitalistic" or "labor," to select the occurrences which it wishes to record or headline and to ignore or suppress others. 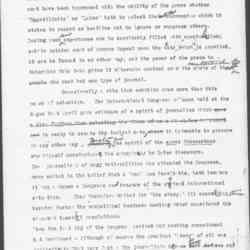 During such an experience one is inevitably filled with speculation: public opinion must of course depend upon the data which are provided, it can be formed in no other way, and the power of the press to determine these data gives it ultimate control over the minds of the multitude who read but one type of journal. Occasionally a situation exhibits even more than this power of selection. 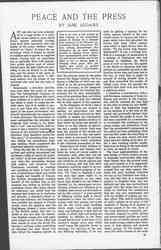 The International Congress of Women held at The Hague last April gave evidence of a spirit of journalism which is ready to create the desired news, that it is unable to procure in any other way, quite in the spirit of the agent provocateur who himself manufactures the conspiracy he later discovers. 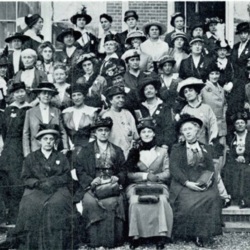 The journalists of many nationalities who attended the Congress were united in the belief that a "row" was inevitable, both because it was a woman's congress and because of the strained international situation. They therefore waited for "the story," ill concealing their boredom during the unemotional business meeting which considered the somewhat technical resolutions. When the last day of the congress arrived and nothing sensational had developed -- [although] of course the greatest "story" of all was implicit in that very fact -- the journalists became both restive and inventive. Two Frenchmen succeeded in creating and reporting an insult to their absent countrywomen which was retold the length and breadth of France; the British correspondent, availing himself of the incident that as the congress was closing at midday the committee rooms were being cleared for afternoon use, cabled that the congress had broken up in confusion and disorder, a statement which received wide credence: the Frenchman thus justified the absence of French women from the congress and the Englishman pleased a large section of the British public who had rejoiced in the fact that the twenty-four English women who held passports issued by the Home Office had been unable to cross the North Sea because a military order prohibiting all shipping had been issued two days before the congress opened. 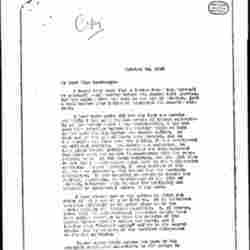 In fact, the attitude taken by the press toward The Hague meeting was to a degree a reflection of what was conceived to be the governmental attitude; in Germany, as the passports were not issued by the Imperial Government but by each municipality, some cities granting them and others not, the papers in each city reflected this in their reports of the congress. 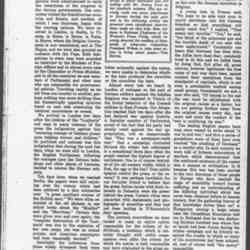 As the delegation of which I was a member went from one country to another we everywhere met men who felt tied hand and foot by their inability to receive any information or to express any opinion contrary to that which the press had decided to foster as in the interest of patriotism and a speedy victory. Such men were the victims of the mental and moral limitations of that war patriotism which is concerned to increase only the emotions which contribute to the relentless prosecution of war. Everywhere we found evidence of a group of men and women -- how large we were of course unable to determine -- who, [although] they are not opposed to the war and regard their own countries as sinned against and not as sinning, still feel that their respective countries ought to be content with a limited program of victory. Yet "even in England a man who says that peace ought to be made with Germany on any other terms than dictation by the Allies is attacked by the newspapers as pro-German, without any reference as to whether those terms are favorable or not to this country." A good patriot of differing opinion finds it almost impossible to reach his fellow countrymen with that opinion and would not for the world print anything which might confuse the popular mind, war belonging to that state of society in which right and wrong are absolute. In addition to his inner scruple lest he may in the hour of his country's danger print that which would lessen the patriotic fervor so necessary for carrying on the war, the differing individual, if he succeeds in getting a hearing for his views, exposes himself to the most violent abuse. 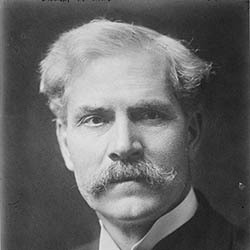 In London last June a paper called John Bull placarded the streets with huge yellow posters upon which in black letters were the words: "To the Tower with Ramsay MacDonald!" It was a striking incident in a campaign of persecution of a member of Parliament who had ventured to challenge the official point of view on the war. 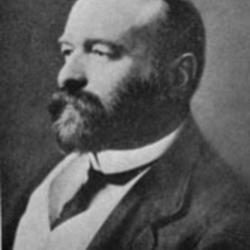 His speech in the House of Commons had been printed as a pamphlet and sent to the families whose sons had been lost in the war, in order that he might be accused of having himself done it and thus committed the cruelty of taking away from the parents the comfort that their sons had died in a righteous cause. I remember a conversation with a mid-European statesman of large influence and service to the country, who bitterly resented the fact that at this time of stress his only knowledge of what was happening hung on the decision of a few men at the capital who practically decided what they wanted the people to know. He had been appointed on a commission to investigate the conditions in the prison camps, and everywhere found that the government's statements to the public had been misleading. Such men say that under the censorship of the press one man cannot tell how many men are feeling as he does. [Although] a man reaching similar conclusions may be living in the next street or town, he cannot be found. The huge agglomerations of human beings of which modern society is composed communicate with each other largely [through] the printed word, and, poor method as it is, apparently public opinion cannot be quickly discovered [through] any other agency. Certainly the most touching interview we had on the Continent was with a man who had been in a responsible position in England when war was declared and who was overburdened equally with the sense that he had failed to convince his countrymen that the war was unnecessary and with the futility of making any further effort. This lack of mobilization of public opinion in so many of the countries of Europe is at present a serious aspect of the war. Even in the most autocratic countries, governments respond to public opinion and governmental policies are modified as men of similar opinion gather into small groups, make a clear statement of that opinion and promote larger groups. At the present moment this entire process in the modification [page 2] of governmental policies is brought to a standstill among the warring nations -- even in England, where the very method of governmental change depends upon the registry of public opinion. But if likeminded people within the borders of a warring nation cannot find each other, much less easily can the search be conducted beyond the lines of battle. As we went from one country to another people would say: "Did you find any one taking our line, thinking as we do?" The people as a whole do not know the terms of settlement, and could only learn them [through] a free and courageous press, as the governmental officials themselves could only thus obtain a full knowledge of public opinion concerning the continuance of the war. Every public man in Europe realizes that before the rulers will think of peace they must know that behind them, if they advocate peace, there will be a grateful and passionate opinion which will be ready to support them against the militarists. Even pacifically inclined ministers in the government itself dare not talk of treating with the enemy while the only vocal opinion in newspapers and speeches is in favor of fighting till the enemy surrenders unconditionally. [Preeminently] in Great Britain and Germany any peace negotiations can be stopped by the militarist elements, which predominate, during war, in Government circles. 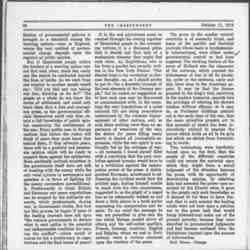 But how can this process be begun if none of the leading journals dare call upon "the various governments to declare what to each nation is the essential and indispensable condition for ceasing the conflict" -- which would of course be but a preliminary to negotiations and the final terms of peace? If in the end adjustment must be reached through the coming together of likeminded people in the contending nations, it is a thousand pities that it should fail [through] lack of a mechanism whereby they might find each other. 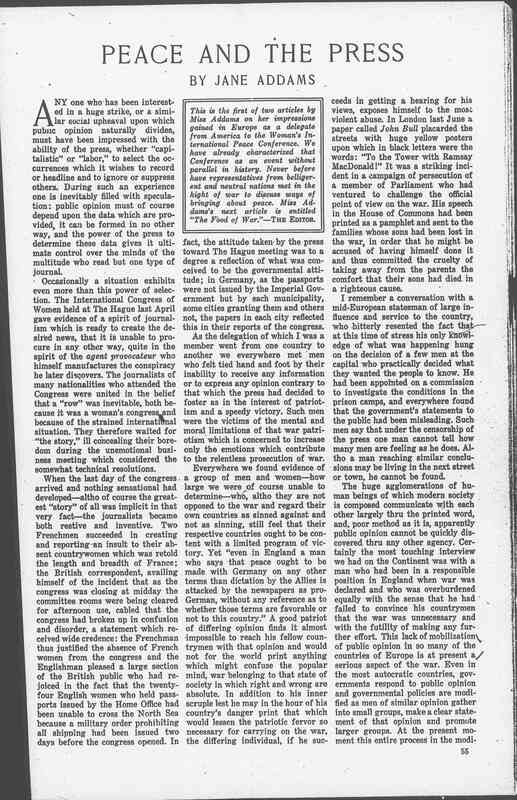 An Englishman who is far from a pacifist has recently written in the New York Nation: "Our dearest hope is for revolution in German thought -- or, as I should prefer to put it -- for a domestic triumph of the best elements of the German people," but he makes no suggestion as to how such men may be discovered or communicated with. In the meantime the very foundations of a noble national life are being everywhere undermined by the constant disparagement of other nations, and, as each fears nothing more than an appearance of weariness of the war, the desire for peace filling many hearts is denied all journalistic expression, while the war spirit is continually fed by the outrages of war. At moments I found myself filled with a conviction that the next revolution against tyranny would have to be a revolution against the unscrupulous power of the press. A distinguished European, accustomed to addressing the civilized world [through] the printed page, finding himself unable to reach even his own countrymen, suggested to us the plight of a caged lion as he vehemently walked up and down a little alcove in a hotel parlor expressing his exasperation and despair. To my mind the message he was not permitted to give was the one which Europe needed above all others, and the self-exiled pacifists, French, German, Austrian, English and Belgian, whom we met in Switzerland, were a curious comment upon the freedom of the press. The press in the smaller neutral countries is of necessity timid, and many of the pacifist and Socialist journals whose basis is fundamentally international, were either under governmental control or had been [suppressed]. The striking feature of the press of Holland was the character of the cartoons, which exposed the hideousness of war in all its brutality, quite as the cartoons, early and late, have done in the American papers. It may be that the license granted to the king's fool, surviving in the modern humorist, accords him the privilege of uttering his shrewd wisdom without offense; or it may be, as Professor Giddings pointed out in the early days of the war, that the more primitive graphic art in this moment of strain has been instinctively utilized to express the horror which holds us all in its grip but which we shrink from formulating in words. Two conclusions were inevitably forced upon us, the first, that the people of the different countries could not secure the material upon which they might form a sound judgment of the situation because the press, with its opportunity of determining opinion, by selecting data had assumed the power once [exercised] by the Church when it gave to the people only such knowledge as it deemed fit for them to have. Second, that in each country the leading minds were not bent upon a solution nor to the great task that would bring international order out of the present anarchy, because they were absorbed in preconceived judgments and had become confused [through] the limitations imposed upon the sources of information. 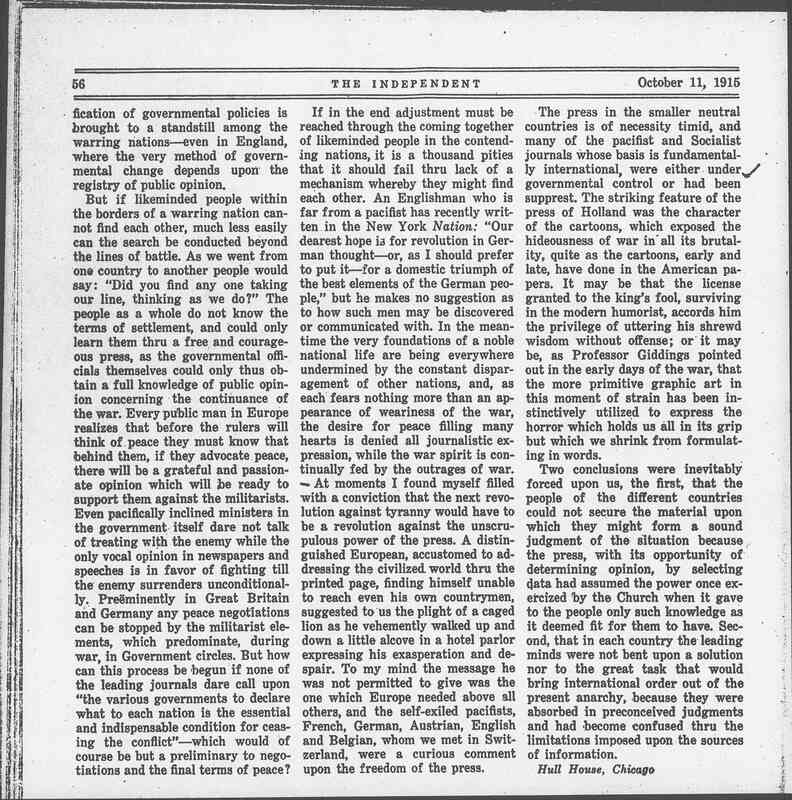 Addams discusses the power that the press has to influence public opinion on World War I.
Jane Addams, "Peace and the Press," Independent 84, October 11, 1915, pp. 55-56. 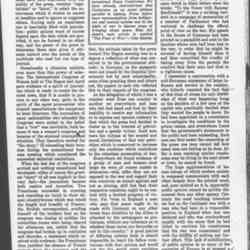 A note by the editor of the Independent reads: This is the first of two articles by Miss Addams on her impressions gained in Europe as a delegate from America to the [Women's] International Peace Conference. We have already characterized that Conference as an event without parallel in history. Never before have representatives from belligerent and neutral nations met in the [height] of war to discuss ways of bringing about peace. Miss Addams's next article is entitled "The Food of War." -- THE EDITOR. 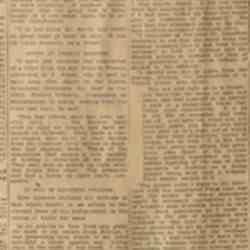 Addams, Jane, “Peace and the Press, October 11, 1915,” Jane Addams Digital Edition, accessed April 25, 2019, https://digital.janeaddams.ramapo.edu/items/show/10236.